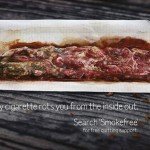 This week Public Health England has launched a powerful new Stop Smoking campaign. 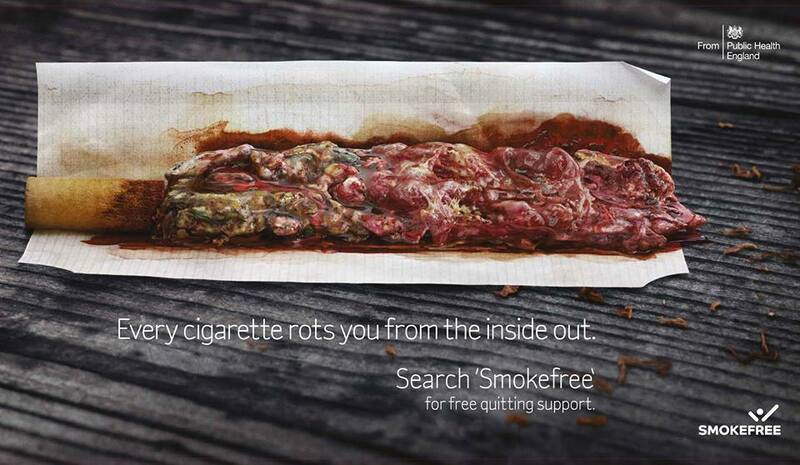 It shows the picture you see here of an unrolled cigarette containing remnants of a badly damaged lung. The inside of the cigarette shows what the inside of your lungs will be like if you smoke. Pretty powerful stuff – especially if you are a visual thinker. Many people respond more to pictures and images than they do to words. Every person that stops, or even thinks about stopping smoking as a result of this picture has no doubt been told or has read about how damaging cigarettes are, yet it wasn’t powerful enough to provoke a strong enough emotion to make a change in behaviour. As a therapist I often use powerful negative visualisations to make a point. The reality is if you want to change something, whether its to lose weight or stop smoking, you have to attach emotion to the decision; it’s not a cognitive or logical process. If it was, you wouldn’t have started in the first place or would have stopped as soon as you realised the horrendous consequences. If you have ever watched Star Trek you will appreciate that Dr Spock would never consider putting something in his mouth that wasn’t good for him, it’s just not logical. Humans however, are more fallible. We make most of our significant life choices based on emotion, that’s why emotional eating is such an easy way to get fat. we eat certain foods because of how they make us feel, or at least how we think they make us feel. Let’s say you want to lose weight but you have joined every slimming club, failed on just about every diet and are still too fat. Let’s say it’s because you love pizza. If you know you want to lose weight and you know that pizza makes you fat, how come you keep eating it? The answer is actually very simple, you eat it because you like eating it more than you like not eating it. Someone telling you it makes you fat is not enough, that’s just “information” you know it’s true but if it has no emotional meaning, you just ignore it. However, imagine this scenario: you are tucking into a tasty piece of pizza and all of a sudden you feel a strange uncomfortable pulling sensation in your stomach and you look down and see your stomach expanding – as if someone was blowing up a balloon inside you, your clothes suddenly feel painfully tight and you feel breathless and heavy, all of this gets worse with every bite. If this happened every time how long do you think it would take you to stop eating pizza? Not very long. That’s because you can actually see and feel the pain pizza it’s causing you in the moment that you eat it, as opposed to days later when you no longer emotionally associate being fat with pizza. Visual association can be a powerful tool; in the Easy Slim At Home package it’s just one of many different techniques that you can learn that enable you to make new associations and literally reprogramme your mind so that you think and feel differently, not just about food, but about yourself in all areas of your life that you would really like to change. You can come along to an Easy Slim weight loss retreat at Champneys Spa and learn the techniques in person on a 2 night or a 4 night retreat, or you can check out EasySlim.me and follow the programme at your own pace at home.